The Casa das Baixas is surrounded by trees, rocks and vines, is the perfect place to relax, fishing, diving, whale and dolphin watching. It is located near the sea, 50 meters away from a natural swimming pool. Main view of the house with the cloud hat in the Pick (wind forecast). Forestal reserve of recreation of S. João to 2 km of the house. 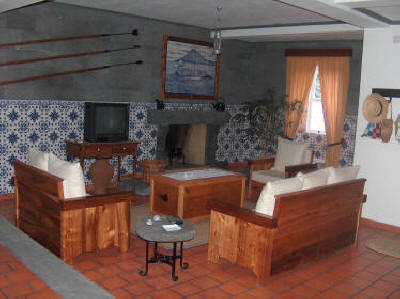 Rooms with rustic furniture, the walls are decorated with rural living scenes of Pico. The visitors have the privacy and home comfort. - veranda with ocean view. - yard with barbeque and table stone. Bedroom with a double bed (2nd floor). Bedroom with a two single beds (2nd floor). Living room with access to the veranda facing the ocean (2nd floor).